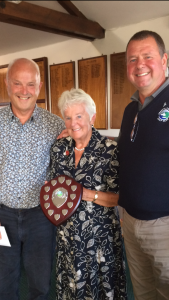 Dot Porter and Crispin Keith, playing together for the first time, were the winners of the FBGC Mixed Open, played on Sunday. Their score of 38 points was one point ahead of Joan Martin & Chris Sprackling, with Katherine Batchelor & Ian Pethick a shot further back in 3rd. Miles Oldershaw thought that he had won the Nearest the Pin on the 14th as his ball ended up only 2″ away from the hole. Unfortunately it was from the 15th tee though!